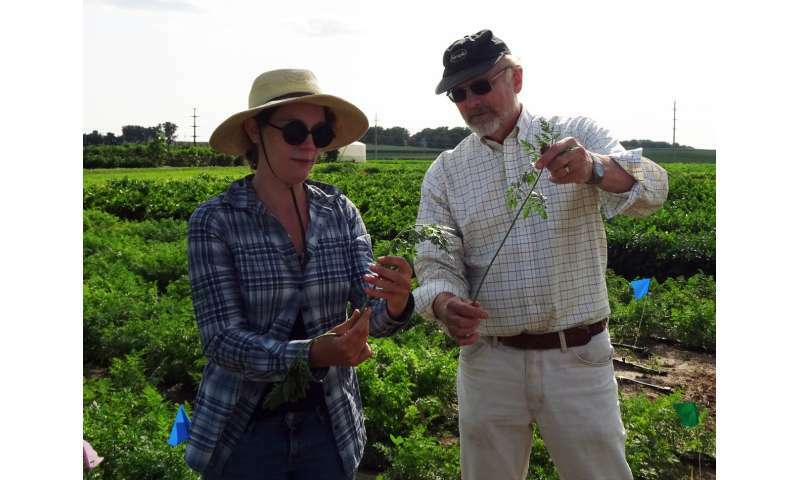 Carrot Breeder Philipp Simon (USDA-ARS, Madison WI) and graduate student Charlene Grahn explain their selection for stronger and more vigorous tops to improve carrot competition with weeds and ease of mechanical harvest. This complex trait is important for both conventional and organic production. Credit: Micaela Colley / Organic Seed Alliance. Have you thanked a crop breeder today? Public-sector plant breeders (for example, at public universities) have developed crops for better productivity. As a result, more food is available to feed a growing population. This research and innovation requires funding. But funding—and revenue from the crops developed—is increasingly hard to obtain. In response, a group of plant breeders met in 2016 to discuss best practices. Julie Dawson, an assistant professor at the University of Wisconsin-Madison, is lead author of a recent paper summarizing their recommendations. Intellectual property rights can protect crop varieties. And licensing can provide revenue to support further developments. But certain types of intellectual property rights can restrict plant breeders from sharing plant materials. That can limit innovation across the board. Finding a balance between these needs is tricky. It's also important: "Crop breeding is critical for the future of agriculture," says Dawson. "Plant breeding programs benefit farmers everywhere. They also benefit anyone who eats." The group has three recommendations. They suggest developing best practices for revenue sharing. They advocate for increased funding for public programs. They also suggest establishing professional standards for sharing plant breeding materials. Historically, many crop varieties were released to the public with almost no restrictions. "But budgets are getting tighter," says Dawson. "Grant funding is also becoming more competitive. Public sector plant breeders need to seek other sources of revenue." Royalties generated by licensing new crop varieties have been one revenue stream. These royalties are usually shared between universities and their plant breeding programs. But the group finds that the distribution isn't always equitable. "Cultivar development can be considered a type of university-sponsored start-up," Dawson says. "In order to continue the breeding programs a reasonable amount of revenue needs to be returned to those programs. Unfortunately, the workgroup found this is not always the case." Overall funding for public plant breeding programs also needs to increase, according to the group. Public breeding programs train the next generation of researchers and plant breeders. They can also focus on low-return, high-value crops that are less attractive to the private sector. For example, cover crops may have relatively low monetary returns. That can reduce interest from the private sector. But they have high social or environmental value, such as improving soil quality or reducing erosion. "Public programs don't have to be immediately profitable, unlike in the private sector," says Dawson. "The public sector is able to respond to regional and long-term needs of U.S. agriculture," says Dawson. "It can do so in ways that are more difficult for private companies that need to turn a profit every year." The group also advocates for uniform standards for sharing breeding materials. They recommend using the Wheat Workers' Code of Ethics as a template. Crop breeders could then work with their universities to better define intellectual property rights and sharable resources. "Tech transfer offices are usually more familiar with medical or engineering innovations," says Dawson. "Plant breeders need existing plant material to continue innovating. Restrictive intellectual property rights can shut off this source of research materials. That essentially turns each breeding program into a silo and hinders innovation."